Little pillows of deliciousness Coconut and Cardamom Wholewheat Cookies are just to die for and comes with a caution' these are dangerously addictive! If you love cookies of all kinds, this recipe is a keeper. Hmm, yum, yum, yum! Crunch crunch crunch! Officially Spring has arrived here, about time too with Easter only just around the corner. It looks like spring has only arrived on the calendar, as forecasters are predicting Return of the 'Beast from the East' we may have White Easter,! Well, we won't be able to do anything against mother nature, then do something that we humans can do, brew a pot of chai!! 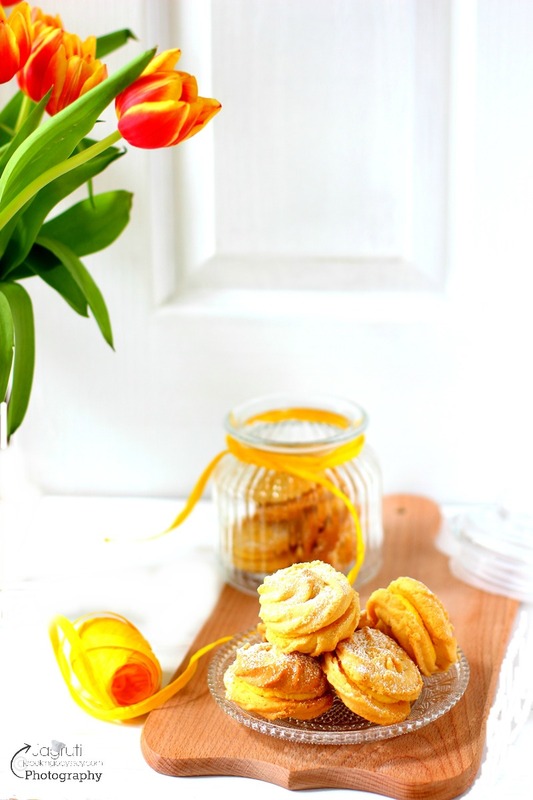 and enjoy these absolutely delicious and eggless cookies to see you through this cold snap. Although Easter tends to be all about chocolate, coconut is quite a popular ingredient used in the easter recipes. I really cannot pin down why coconut and Easter go hand in hand, but I am sure my Gorgeous and delightful Toasted Coconut Layered Cake with Coconut Buttercream would make your Easter extra special. So since December, my cookie pics were sitting silently in my folder, I think it's time to give them a special place on my blog as they turned out amazingly well and became very handy at 5am in the morning when the taxi was waiting at the hotel to pick us up. These eggless, crunchy and crispy coconut cookies can be prepared with basic ingredients which are so easily available in our kitchen. 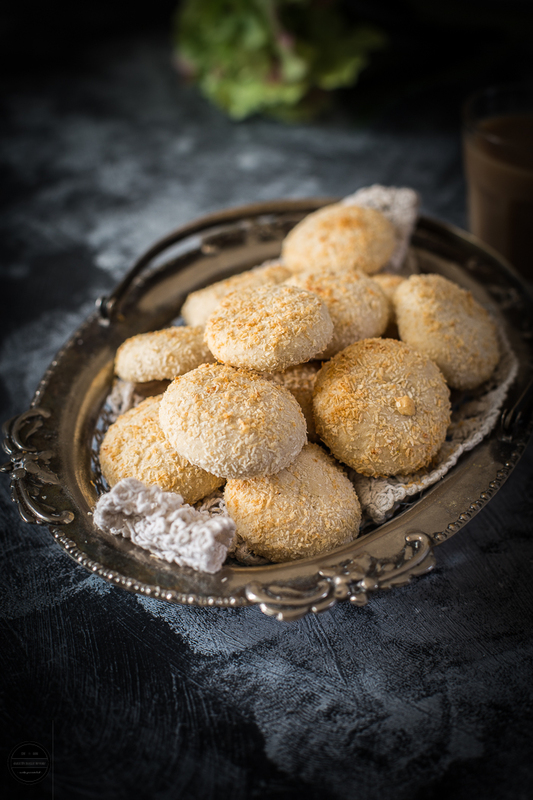 Nutty coconut, sweet and lovely delicate flavours from aromatic cardamom lend a unique taste and aroma to these cookies. Definitely, these are perfect for special occasions to indulge in . In my views, these cookies are not just guilt free or healthy, because they are made with whole wheat. As they are also loaded with Butter and Sugar so not every day but on an occasion like Easter, Christmas, a tea party or a coffee morning is perfect for it. Don't like cardamom, omit it totally and add vanilla essence. Make vegan by using coconut oil or butter. Preheat the oven to gas mark 4 or180C.In a big bowl or food processor whisk butter and sugar together until light and fluffy. Add salt and whisk again.Now add flour, coconut and cashew pieces if using ( Leave a one tablespoon coconut aside to roll the cookies)Mix everything well and knead a dough ( it should be like a chapatti dough) if needed add milk and knead the dough.Cover the dough with the clingfilm and rest in the refrigerator for 10-12 minutes.Remove the dough and knead it again for a couple of minutes. Divide the dough into small equal sizes and roll into balls.Roll them into the coconut, If you want you can press the cookie balls with your thumb and make slightly flat.Line them on a baking tray and bake them for 18-20 minutes or until bottom parts of the cookie gets slightly golden brown.Remove it from the oven and leave it to cool completely.Enjoy with a cuppa or store in an airtight container. I love thr combination of coconut and cardamom. I would love try these cookies. I can almost taste all of those wonderful flavours just reading your recipe. Glorious! Pillows of deliciousness? Sold! I love the flavour combo in this. Gorgeous photos and i love the flavour profile - cardamom & coconut - so good. These would be perfect with an afternoon cuppa! Love the flavor combo! It sounds so yumm cardamom with coconut..gorgeous clicks !! Love the coconut and cardamom flavour combination - cookies look divine. Cardamom flavoured cookies must be tasting like nankhathais .. they look nice. I just want to munch few cookies rite now, can smell the flavor of this cookies rite from your picture. Absolutely droolworthy. I just love anything with coconut in it! These are so delicious and less guilty feeling due to the use of aatta... totally yum! What a coincidence Jagruti, last Dec I baked some wheat coconut cookies, quite a few times and huge batches. I've yet to post my recipe on the blog. I simply love these cookies as they are so easy to make, tasty and very aromatic. The cookies look super amazing and the recipe, super simple with ingredients readily available in the pantry. What I liked more is the effort of packing homemade goodies during travel. Being vegetarians, this is always a worry, finding eggless snacks etc. But homemade is always the best, I guess this also stems from the fact that we have been brought up this way. 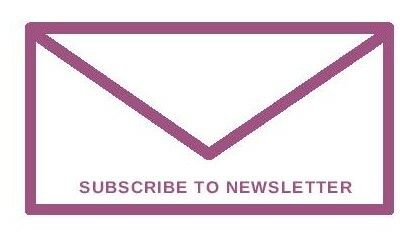 PS - Glad the post made its way to your blog from the drafts! What an amazing combination coconut and Cardamom. No doubt about the taste... Such a divine cookies ! Healthy combination in cookies.. both are divine in taste.. I assure your home should smells heaven while baking those beauties. Beauuuutiful clicks! 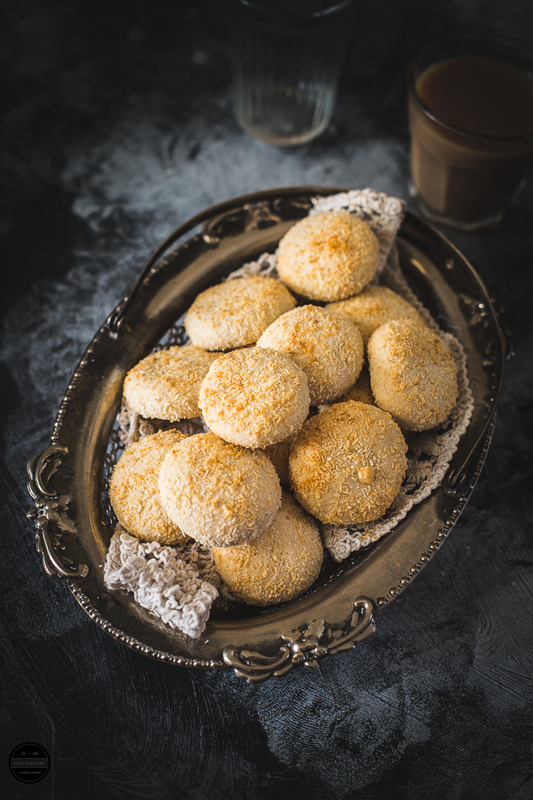 Your home must have smelt amazing while these cookies were baking with aromas of cardamom and coconut. I am like you and always pack something before going on vacations. They all argue when I am making but give blessings when eat that on the trip. The cookies looks absolutely delicious with coconut on top. I always fall in this combo flavor, so so amazing !! 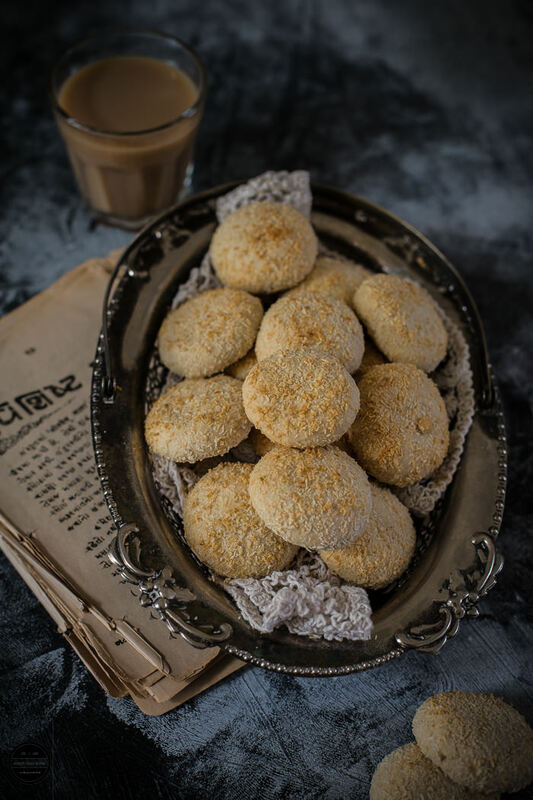 Both cardamom and coconut together sounds delicious.. Yummy share..
Love these coconut cookies, yours looks so yumm jagruti, you are always tempting me! I can imagine the aroma when baking and the taste when done. This cookie needs to be flinched when it is cooling. These cookies look so delicious, the combination of the coconut and cardamom is a match made in heaven.I hope you are going to send some over. These whole whet coconut cookies look gorgeous!! Such a healthy and flavorful treat Jagruti.